Register with us to be instantly alerted when your ideal properties are first listed! Miamiwaterfronthouses.com is Miami’s premier waterfront property website. Click on the interactive map to explore waterfront homes for sale by areas and neighborhoods. This free service is provided by Legacy Realty Services, in Miami, Florida. The areas of Golden Beach, Sunny Isles Beach & Aventura are coastal & luxury suburban communities in Northeast Miami-Dade County. These areas offer some of the most luxurious real estate in all of Miami-Dade County. Aventura is home to Aventura Mall, the third largest mall in the United States. Eastern Shores is an exclusive neighborhood located inside of North Miami Beach. The guard gated community offers exclusive waterfront living on the Intracoastal Waterways. The areas os Keystone Point and Sans Souci are located within North Miami. These areas offer accessibility to Biscayne Boulevard and I-95 and beaches while being a quiet getaway from the hustle and bustle of the areas south. Miami Beach is seen as a trend-setting arts & entertainment Mecca, and a shopping & cultural wonder by visitors, world travelers, celebrities and locals alike. Miami Beach is no longer just a place to lay on the beach soaking up the sun, due to an economic boom that has sprung from the refurbishment of the Art Deco Historic District, Miami Beach offers visitors & residents a dazzling array of amenities to enjoy. 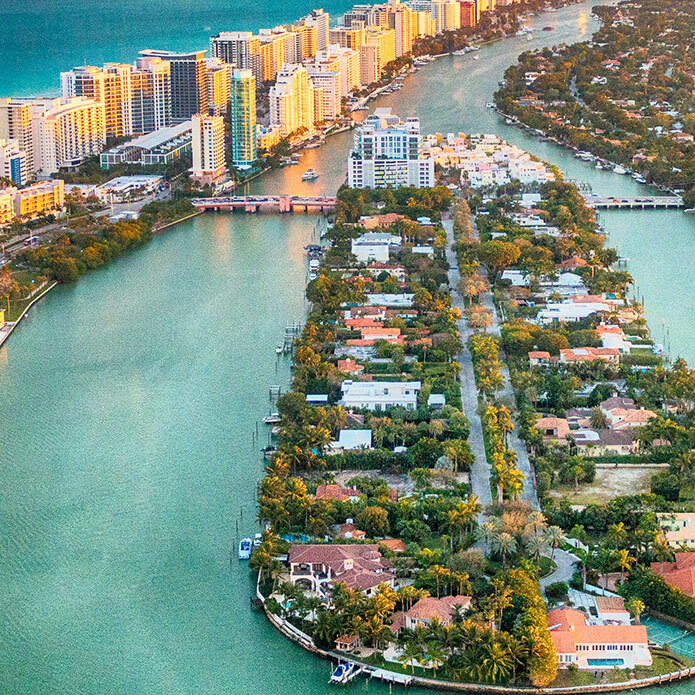 The historic upper east side of Miami offers quiet waterfront living just a stone's throw away from Downtown Miami, Design District, Midtown, and Miami Beach. The areas offer the closest suburban living to Downtown Miami with waterfront houses on Biscayne Bay. Among the hustle and bustle of Miami’s ever-growing metropolis, sits a laid-back, waterfront community unlike any other. Nestled between Biscayne Bay and Highway U.S. 1, this village-within-a-city offers visitors a unique alternative experience to the standard South Florida visit. With everything from gallery walks and outdoor dining to sailing regattas and wacky festivals, there are endless activities. Coral Gables’ founders imagined both a "City Beautiful" and a "Garden City," with lush green avenues winding through a residential city, punctuated by civic landmarks and embellished with detailed and playful architectural features. Known as The City Beautiful, Coral Gables stands out as a planned community that blends color, details, and the Mediteranean Revival architectural style. The Village of Key Biscayne, located a few miles from the mainland, is a quiet community surrounded by nature, yet close to the excitement of metropolitan Miami-Dade County. Welcome to our island paradise! Aventura, one of Miami-Dade's newest communities, was incorporated in 1995 and is a vibrant, full-service municipality with a diverse demographic base and is recognized internationally as a premier location in which to live, shop and play. Aventura is best-known for large-scale condominium projects and apartment buildings. Restaurants, movie theaters and the Aventura Mall are convenient nearby. Sunny days on a white sand beach or sizzling nights on the town. The City of Sunny Isles Beach lies between the flowing Intracoastal Waterway and the Atlantic Ocean. Our resort community is the destination of travelers who seek the ultimate South Florida experience. In the center of it all, yet a world apart, this tropical barrier island surrounds you with the best of everything. 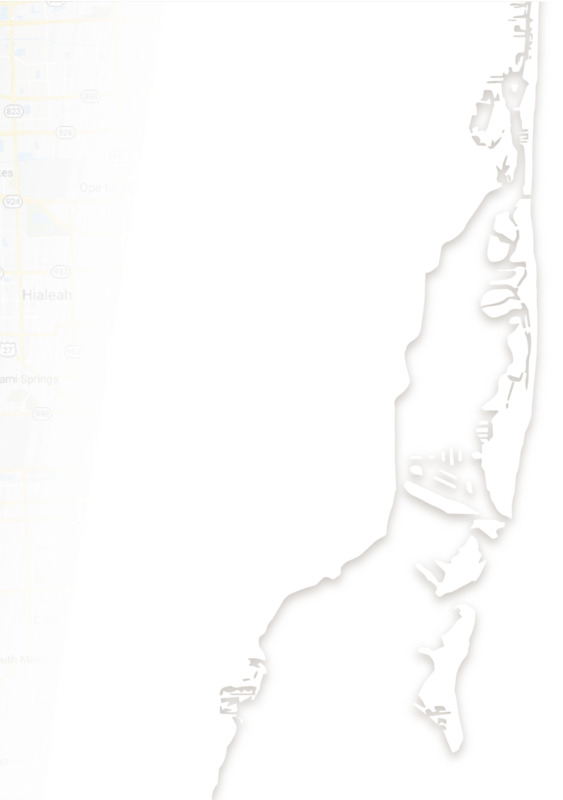 The ocean front Town of Golden Beach sits on 1.3 miles along the northernmost portion of State Road A1A at the Miami-Dade/ Broward County line in South Florida. This small jewel of a town is bounded by the Atlantic Ocean to the East, the Intracoastal Waterway to the West, and the coastal municipalities of Hallandale Beach to the North and Sunny Isles Beach to the South. 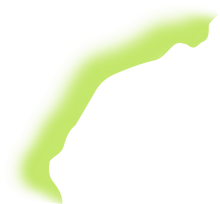 Press arrow below to view neighborhoods. Eastern Shores is a neighborhood within the city of North Miami Beach in Miami-Dade County, Florida, United States. It is located about 12 miles (19 km) north of Miami, just south of the city of Aventura. This guard gated community offers exclusive waterfront living on the Intracoastal Waterways. Almost every single property in Eastern Shores has a waterfront view. Keystone Point is a gated community within the City of North Miami, that consists of 880 single-family homes; most of which have direct access to the waters of Biscayne Bay either through canals or directly on the bay. Keystone Point is located on the other side of Biscayne Bay from Bay Harbor Islands and Bal Harbour in the northern part of Miami Beach. Sans Souci Estates is a neighborhood in the City of Miami which lies just north of Belle Meade and south of Keystone Islands. It is a private, gated community of single family homes. 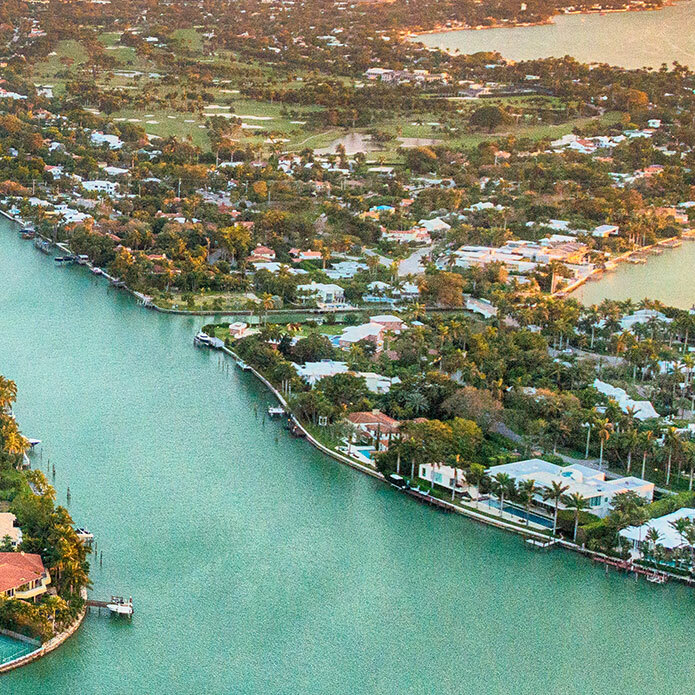 The historic & guard gated neighborhood of Sans Souci Estates is home to some of Miami's most unique & private waterfront and non-waterfront homes. 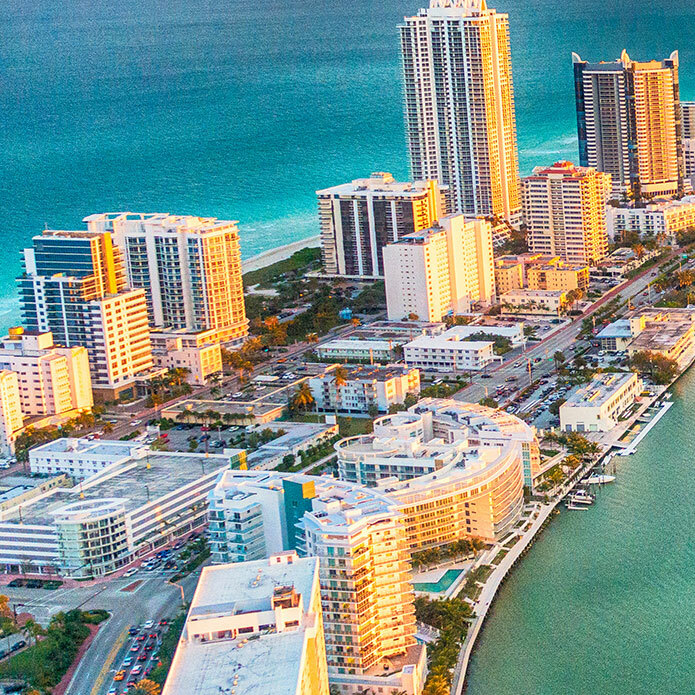 Miami Beach is everything you've heard about, but you have to see it for yourself. The South Beach Art Deco District is a whimsical collection of more than 800 architecturally protected buildings in Miami Beach from the 1930s and 1940s – a definite must-see. North Beach's Ocean Terrace is fast becoming a smaller version of South Beach, with inviting oceanfront hotels and cafés. Located between the Mainland and Miami Beach, the Venetian Islands are comprised of 5 isles connected via the Venetian Causeway. The islands offer waterfront properties on the Intracoastal Waterway and easy access to Biscayne Bay. These secluded islands offers its resident's quiet living with close proximity to South Beach and Downtown Miami. Located off of MacArthur Causeway in South Beach, these gated, private and exclusive islands are tucked away between Miami Beach and the Mainland. The three islands are homes to some of the worlds rich and famous. These secluded islands offers its resident's quiet living with close proximity to South Beach and Downtown Miami. Bay Point Miami is a gated community in the upper eastern side of Miami. It stretches from Northeast 41st Street to Northeast 50th Street running parallel to Biscayne Boulevard. The neighborhood is unique in that residents actually own the streets within the neighborhood. Miami and South Beach are about ten minutes away. Coral Gables, Hialeah, and Aventura are all roughly twenty minutes away. Edgewater is a neighborhood in Miami, located north of Downtown and Omni, and south of the Upper East Side. It's roughly bound by North 17th Street to the south, North 37th Street to the north, the Florida East Coast Railway and East First Avenue to the west and Biscayne Bay to the east. Edgewater is primarily a residential neighborhood, with many historic early 20th century homes. The Village of Miami Shores is known for its small town feel and variety of Art Deco and Mediterranean Revival-style homes. Bayfront vistas, quaint churches and wide, tree-lined streets are all part of Miami Shores' charm. The attractions are mostly residential in this area, which is home to a recreation center, performing arts center and a country club. This private and gated community is located just off Main Highway in Coconut Grove. The Moorings has just two main roads and 37 large lot estates, a few of which are waterfront. The community has a 24-hour security guarded entrance and is in close proximity to Downtown Miami, Miami International Airport and Coral Gables. A private, gated community, Entrada Estates features tennis courts and roaming security guards. Located on the south side of Coconut Grove, the community is composed of three streets of mostly waterfront homes. There is a 24-hour security-guarded entrance and the community is in close proximity to Downtown Miami, Miami International Airport and Coral Gables. Located in Coral Gables, this secluded community on Biscayne Bay features 80 homes. Considered one of the premier Coral Gables' neighborhoods, this gated community offers great accessibility to Downtown Miami, Miami International Airport and Coconut Grove. Located at the southern tip of Coral Gables, this secluded oasis offers residents a waterfront Arnold Palmer Championship Golf Course, tennis courts, 3 marinas, country club, fitness center, clubhouse, youth program, and dining options. Situated on 145 acres, this community offers paradise a short distance from Metropolitan Miami. Considered one of Coral Gables' most private and exclusive communities, Cocoplum is a prestigious and exclusive waterfront community. The gated community has 24-hour security, clubhouse with a pool, fitness center, tennis courts, basketball courts, playground, a yacht club, full service members-only marina, and beautiful landscaping. Gables Estates is a gated, private waterfront community located on 200 acres in Coral Gables. This prestigious community offers 24-hour security, a clubhouse, and is comprised of 170 homes located on wide, deep-water canals that wind through the exclusive community and out to Biscayne Bay. The exclusive nature of the neighborhood makes it popular among celebrities. This private and gated community features 136 waterfront homes on over 150 acres. The community offers 24-hour security, lush landscaping, and tree-lined streets. The waterfront homes are situated on deep, wide canals providing easy access to Biscayne Bay and the Atlantic Ocean. Hammock Oaks is a private, gated waterfront community comprised of 107 private homes. The community is popular with families and offers 24-hour security, basketball and tennis courts, and boat docks with access to Biscayne Bay. The gated waterfront community of Gables by the Sea is located on the scenic Old Cutler Road and features waterfront homes on 19 streets. The community features 24-hour security, playground, basketball and tennis courts, and softball fields. The community has no fixed bridges, which provide all waterfront homes easy access to Biscayne Bay. Developed in the 1920s, the Coral Gables Waterway extends from Biscayne Bay to the Biltmore Hotel. Originally envisioned by Coral Gables founder George Merrick as the new Venice, the series of canals is now home to beautiful homes with dock slips and access to the bay. Many of the homes on the extensive waterway system can house larger vessels and have "no bridges to bay" access. Stretching from Crandon Park, home of the Sony Ericsson Tennis Open, in the north, down to Cape Florida State Park, the Village of Key Biscayne is home to some of America's Best Beaches. Along the 7 miles of beach are some of Miami's most luxurious and exclusive apartment residences. Key Biscayne has some of Miami's largest waterfront estates including the Southern Most White House, where President Richard Nixon lived during his presidency. The large waterfront homes provide some of the best views of Downtown Miami at night. Legacy Realty Services, Inc. specializes in the sale and acquisition of high-end homes, multi-familty residential properties, office and professional buildings. Established in South Florida over 32 years ago. Legacy Realty Services, Inc. has assisted thousands of clients in Miami-Dade, Broward and Palm Beach Counties in finding real Estate solutions. Our deep understanding of the South Florida Real Estate Market can assist with an investment property, a luxury home or building a new home. Legacy Realty Services, Inc. is ready to assist you with all and any of your Real Estate needs. With over 40 years of development and project management experience, Legacy Building Corporation is responsible for over $500 million in real estate development projects across southeastern Florida. We are a full service development and custom-home builder with a team of licensed and experienced real estate professionals who bring valuable insight and experience to each project. The Legacy team has an extensive background in architecture, engineering, construction, real estate development, real estate sales and leasing, and project management.